This book I’m not sure about. I might have bought it, or it might have initially been bought for my brother Ken. But I think it was mine. A strange choice at any rate, as SUPERBOY AND THE LEGION OF SUPER-HEROES wasn’t a huge favorite of mine, as we’ve covered previously. So maybe it was something about this stark white cover that caught my attention, or the direct threat of death (a threat which, in a rare case of truth in advertising on comic book covers, would genuinely be delivered in this story) I’m not sure at this late date. But it was the next comic book that I read. And, in point of fact, I liked it. Not enough to have bought the next issue, though, despite my having an interest in it. Again, I’m not certain whether that was due to me not coming across it on the stands (distribution could be haphazard in those days) or whether it was accompanied by other comics that I desired more. 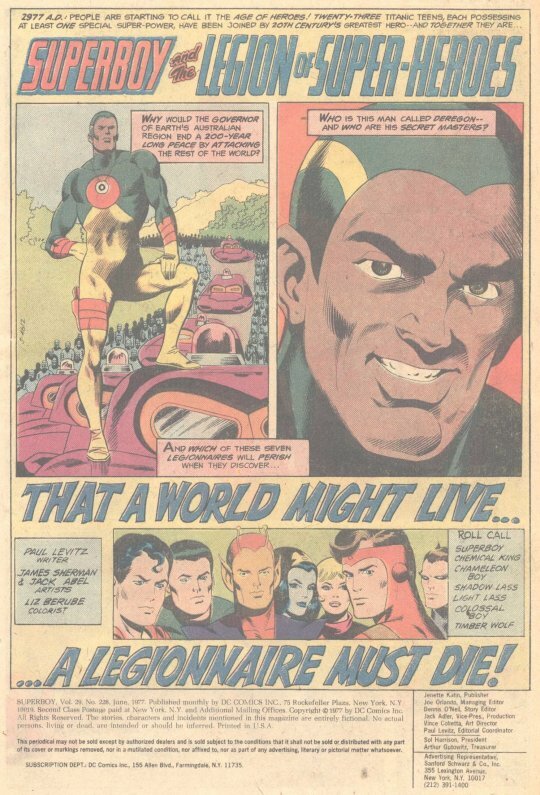 In either case, it would be decades before I would read the follow-up to this story, the final in the short career of the Legionnaire known as Chemical King. 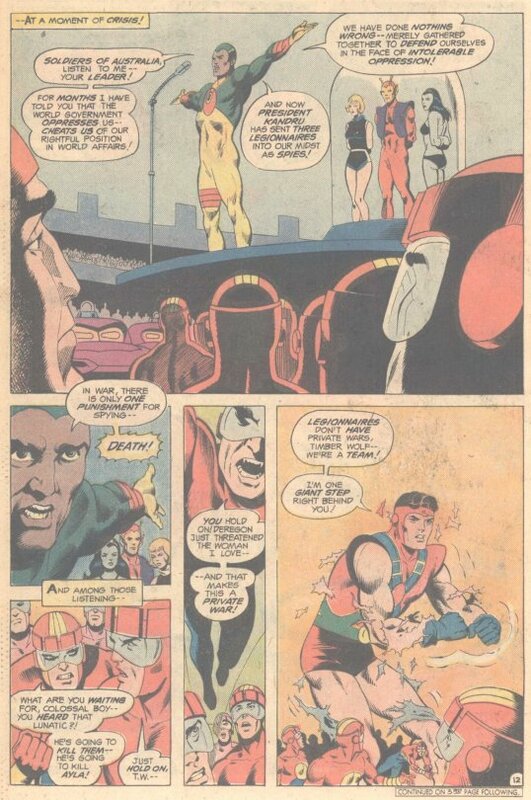 The story opens with Wildfire, the Legion leader, and Chameleon Boy, being summoned to the office of the President of Earth. Turns out that the newly-elected leader of the Australian Region of Earth, one Governor Deregon, is planning to end 200 years of peace on Earth by marching his nation off to war against the other powers of the globe. The President covertly asks the Legion;s Espionage Squad to intervene and prevent this from happening–despite the fact that Deregon is within his legal right to do so. 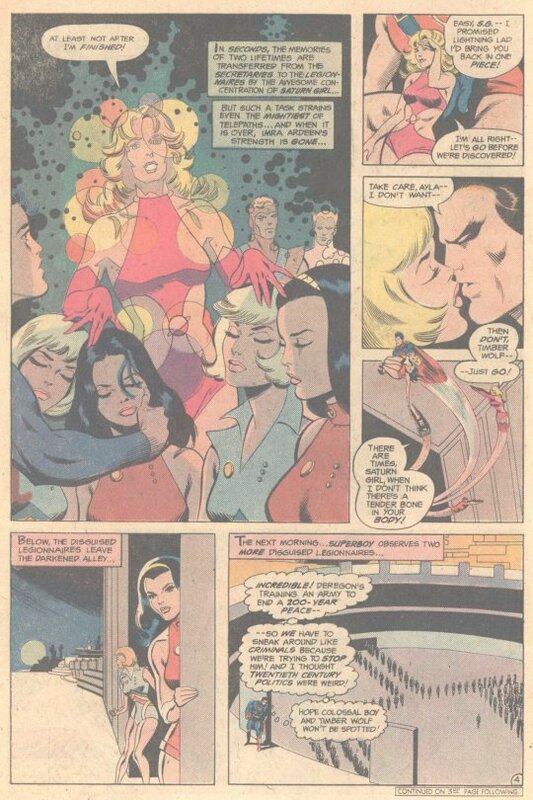 The disguised Legionnaires know that Deregon is getting help from some off-world source, so Light Lass and Shadow Lass attempt to listen in on his communication with this mysterious benefactor, relaying information to Superboy and Chemical King in orbit. Chemical King is feeling depressed because he’s so seldom of use on Legion assignments–here, his power to control chemical reactions allows him to somehow hone in on the communications hyperbeam. But he’s down nonetheless. 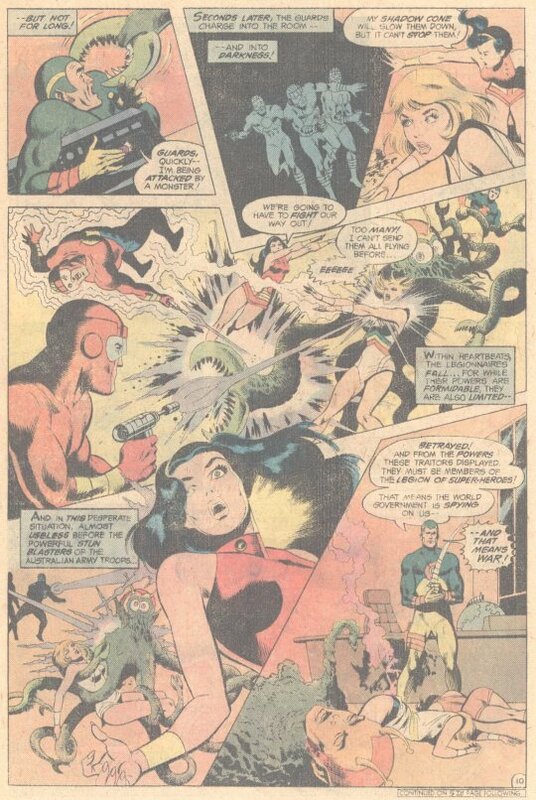 And when Deregon notices his call being traced, Chameleon Boy, disguised as an insect, blows the Legion’s cover, leading to himself and the two Lasses being captured. 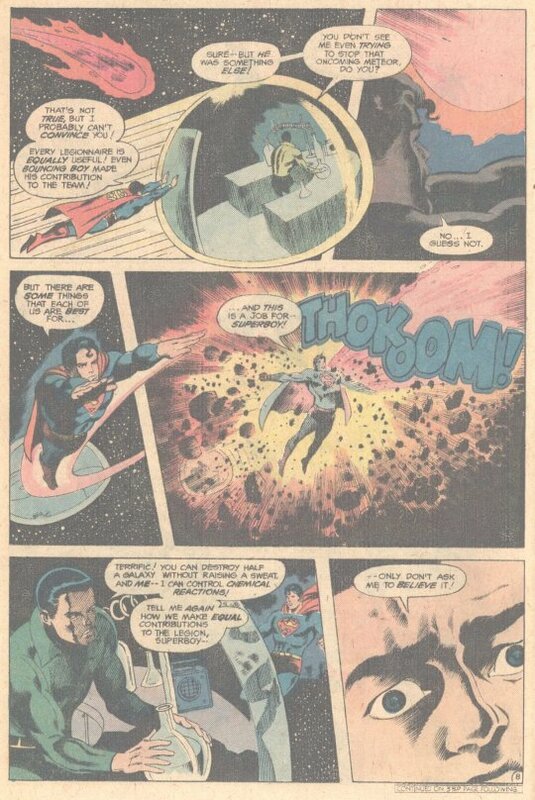 Meanwhile, Superboy and Chemical King have managed to trace the hyperbeam signal to its source–the home planet of the Dark Circle, an evil power that has crossed swords with the Legion in the past. They’re hoping to destabilize the United Planets by causing conflict on Earth. And it’s working–the espionage of the captured Legionnaires gives Deregon all the pretext he needs for war. 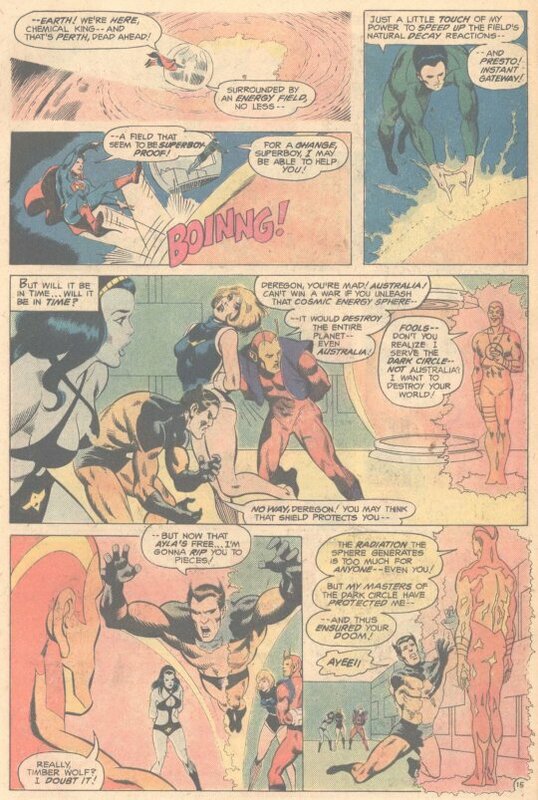 Colossal Boy and Timber Wolf drop cover in order to go to the rescue of their comrades, who are about to be executed for espionage. But the whole mission is in the crapper by this point. 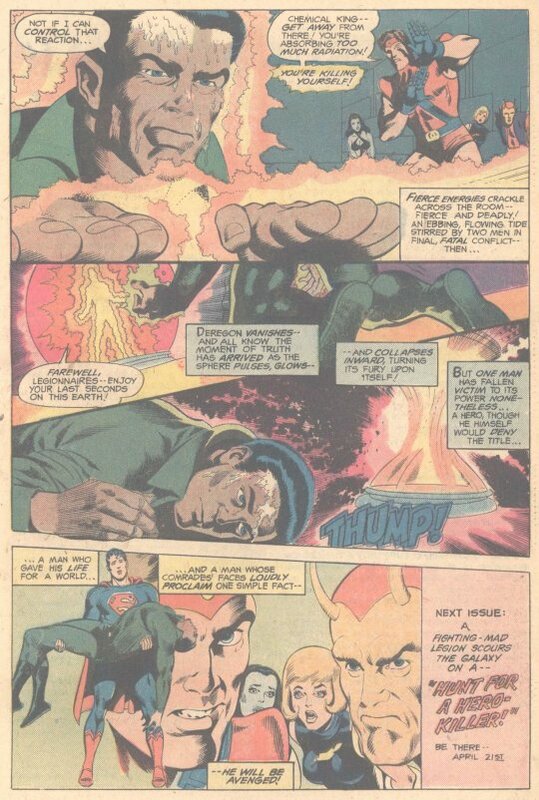 Even Superboy can’t approach the radioactive sphere at this point–but Chemical King can dampen down its reactions, though it means taking a lethal dose of radiation himself. Interestingly, on this final page, the otherwise-white Chemical King’s skin tone is colored dark, as though he were a black man. Looks like a mistake to me, but one that’s carried through consistently in this sequence where Chemical King dies saving the world. Again, a weird choice if in fact it was a choice, and an odd coincidence if it was not. Anyway, Deregon gets away, the Legion is sad and angry, and they intend to take the fight to the Dark Circle next issue. And that’s where we To Be Continued the heck out of here.